Since the inception of indoor aquatic parks, metals such as stainless steel alloys, carbon steel, iron, copper, bronze and aluminum have been commonly prescribed materials with regards to indoor pools and enclosures. Corrosion issues related to building materials have challenged aquatic operators and building architects, especially in the past decade as facilities have expanded with complicated and exposed interactive surface areas, sprays, slides and warmer water. Today, proper ventilation and chloride-induced stress corrosion cracking typically rank high with those involved in design and refurbishment of new and existing structures. Nontraditional materials such as fiber reinforced polymers have begun to gain prominence within the aquatics industry, as managers have begun to feel the financial burdens of maintaining corrosion costs in check while reducing operation downtimes related to maintenance. 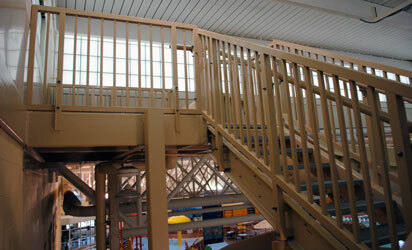 Like most indoor aquatic facilities, Westlake Recreation Facility, which houses five pools, a diving well, a children’s play pool, lazy river and slides, faced serious corrosion-related challenges. Repainting over steel was becoming a semiannual occurrence. 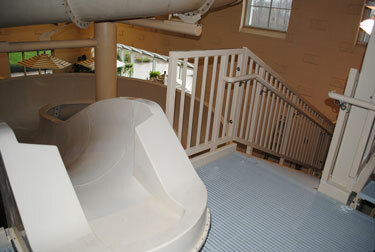 A multistory stair tower connected to multiple slides was subjected to chlorine and moisture on a daily basis, making it especially challenging to maintain. The Aquatic Manager of Westlake Recreation, Don Cisnar, worked with Harrington Industrial Plastics to proc ure Strongwell’s Made in USA FRP (fiber reinforced polymer) material which will provide years of maintenance-free service. The installer, Lake Construction, was able to fabricate DURAGRID® I-4000 pultruded grating and stair treads, STRONGRAIL® handrail and multiple EXTREN® Series 625 structural shapes onsite without the use of welding or dangerous heavy machinery. Overall, Westlake Recreation was pleased with ease of installation and in the years since its installation in 2009, has been pleased with the lack of maintenance required with Strongwell’s FRP components. Click here for the entire case study.